UD Trucks curtail production of medium-duty cabovers for the US market. The curtailment of production of medium-duty UD cabovers to the United States is not expected to have ramifications for the firm’s Australian operations. 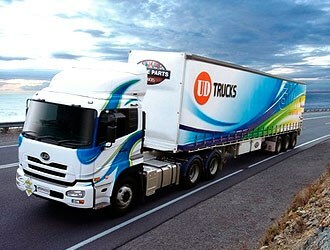 UD Trucks curtail production for the US market. Australian specification vehicles are more closely aligned with Japanese and Malaysian product than the left-hand drive US vehicles, Oceania region Marketing Manager Chris Gillespie says. Explaining the move, taken after 27 years in North America, the firm's Japanese headquarters says: "Due to a combination of factors, including the continued shrinking of the cab-over-engine market segment and the accelerating cost of regulatory compliance, a strategic decision has been made to end production of UD trucks for the US market." UD Trucks says it delivered about 800 vehicles in the US last year, adding that the decision would not affect South America, where the "market dynamics are very different and the UD Trucks brand has strong potential". "Any missed production for the US will be filled up quickly with other markets," Gillespie says.